". . . objective facts par excellence — the kind that can be observed and understood from many points of view and by individuals with differing perceptual systems." We are looking at Thomas Nagel's take on the distinction, if any, between objective and subjective facts ... at least to the extent that he describes it above. The Professor used lightning (and rainbows) as an example of this distinction. "Lightning," he said, "has an objective character that is not exhausted by its visual appearance [as we see it appearing to us]." In other words, the physical aspects of a bolt of lightning discharging from the clouds above are objective facts. On the other hand, recall that subjective experience, for Professor Nagel, is an inner awareness or perception of the quality of an event ... which perhaps can be described to others in a reasonably full way, but which cannot actually be fully understood or experienced by others ... at least not in exactly the same way that the first person experienced it. I realize the previous sentence is a mouthful. So take a moment. Please re-read it once or twice. And then compare it to the Nagel quotation which I used as my lead in to this post. The character of objective facts, as described above by Nagel, is that they can be "observed and understood" by all of us, while the character of subjective facts is that they are based on our inner feelings, which cannot be directly observed except from the 'first person' point of view. To use Bill Cosby's old stand-by as my example: We all know what chocolate cake is, what its ingredients are, and how it is made. Those are the objective facts. But we cannot know exactly how it tastes in the mouth of our neighbor. That aspect is referencing a set of subjective facts. Subjective facts require first person consciousness to even be aware of them. - to be supplied shortly. 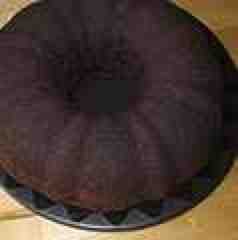 The cake is from Wikipedia (yum! 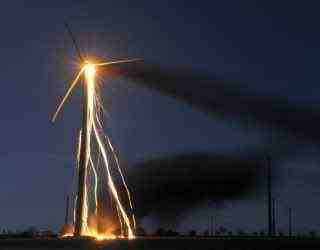 ), but I have temporarily lost track of where I found the image of lightning striking the wind turbine. Happy Memorial Day, to all. And stay out of thunder storms! Do I have this right: lightning has a physical cause, electric charge builds up in clouds until a point where attraction to the opposite charge in the ground becomes so great that a bolt of electricity goes shooting from the clouds to the ground - this we all see and can learn how it works, yes? Yet how I personally see this bolt in my mind, and how I emotionally react to it, will be special to me and different from you. That is what Nagel means by 'subjective experience', yes? And finally, no matter how I describe my experience to my friend or lover, he or she can never actually really know what my actual real experience was, yes? And that last part would still be true even if some doctor handed me the world's greatest MRI image of my brain taken at the very moment I saw the lightning bolt, is that about it? Yep, llb, that's about it. There's no public playback button for what's going on in your mind. Could be a good thing, heh? Keep that van in park, my friend.